I remember being a young boy, craving music, and the only CD I owned I actually stole from my older brother. This CD meant the world to me, and it was surprisingly a CD written and produced by the band known as Creed. The CD was the Weathered album, which would end up being the last real album they would release. I also remember that I would look for the other Creed albums as if I was looking for a million dollars, and when I finally found the album, it was the Best of Creed album with a DVD including some of their best music videos. Yet still I remember frantically searching for these albums, and finally I got my hands on the My Own Prison album, which was the debut album, and I can tell you I rocked out more than I ever remember rocking out in my life. I had fallen in love with my very first band. I remember talking about how awesome this band is, and people around my age would say that I have no real taste of music, and for a while I thought about maybe not having the right music taste. A few years down the line, I finally got a hand on the sophomore album, Human Clay and I felt really happy with the sound. However, In between the time of the Best of Creed and Human Clay I found out that the band had split, and I was felt like the wind had been forced out of my stomach. When Scott Stapp released The Great Divide, his solo debut album, and I was STOKED! I was completely excited to hear something from the Creed guys, and it was an awesome album. Then I started researching why the break-up happened, and I found out that the guy I wanted to be like, I wanted to sing like, and I wanted the same hair, had really strong drug and alcohol problems. I remember thinking to myself that all these songs sound like an eternal battle of these problems, and I felt like I was betrayed. Although, I was being spiritually uplifted by the songs, so I didn’t feel completely let down. At the same time this was happening, I was watching World Wrestling Entertainment and getting ready for the Royal Rumble Pay-per-view, I heard this song called “Find the Real” and I loved the sound. I remember thinking to myself “They sound like Creed”. A few weeks later I was once again watching WWE, and I heard Edge’s theme song, “Metalingus” and found out that Alter Bridge* had done it again, and I found out that they were going to be releasing an album. When I got the date of the album, I put it on my phone calendar, and the day that One Day Remains was released, I went out and bought it…probably the first sale for the CD on my local Best Buy. Don’t think it’s weird, I did the same for the Daughtry, David Cook, and Switchfoot releases. It’s normal. As the years progressed, I heard about the sophomore Blackbird album was going to be release, and once again, I found out about it from WWE TV. So, thanks to WWE I am a huge Alter Bridge fan. I know what your thinking, what does this article mean? What does it serve? Well it was announced earlier this year that Creed will be on the road again and releasing the rumored 4th album Full Circle and it has been so many years since they worked together, do they still have what it take to make me want to go out and purchase their Full Circle album? They performed on AOL Sessions, and they seemed that they were great, brought back some great memories, but it was all old song. The fact that they are planning on releasing this album makes me wonder if they can truly make a memorable record. Something I am sure we all think about. The thing that I have been thinking about is what is this album going to sound like? Mark Tremonti (Lead Alter Bridge Guitarist and Creed Guitarist) is used to Myles Kennedy’s style of writing, as Scott’s been on his own for quite sometime. 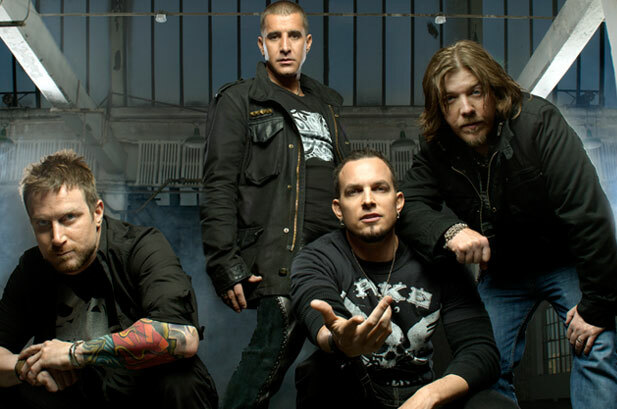 Scott claims that after him and Tremonti met, they wrote a song called “Full Circle”, which is the title song of their rumored album. I will be honest with you; if it sounds anything like Weathered I will be happy. But after Scott Philips(Drummer) said that “Blackbird is the most fun album they get to play live”, its going to be interesting to see if they put all their heart and soul into this album. I don’t know what to expect, but I am excited. I am ready for something unknown as this album being released. However, I am afraid of what might end up coming out of this reunion tour. Will Creed be a full time return? Will Alter Bridge and Scott Stapp remain as two different projects and have Creed on the side? Only time will tell.